SAP Leonardo and Digital Transformation: The Strategic Implications | Constellation Research Inc. Billed as a "digital innovation system", the central focus on SAP Leonardo at the company's massive annual confab in Orlando this week speaks volumes as to its perceived importance to the firm's overall vision. SAP is clearly betting Leonardo is the right mix of technologies, tools, patterns, and services to help large companies deliver quickly on the latest high-impact digital capabilities beyond the fundamentals in the increasingly commoditized public cloud industry. The specific capabilities targeted by Leonardo include technologies such as Internet of Things, machine learning, analytics, blockchain, and big data as well as key enabling approaches like design thinking and tapping into strategic pools of shared intelligence. You can get a clearer sense of the specifics of the Leonardo announcement from my industry colleagues Chris Kanaracus and Andy Mulholland, as well as Holger Mueller. Most organizations today badly need a leg up to close their digital gap, and Leonardo is very much aimed at this target. As I've noted on ZDNet recently, the data shows there's no doubt that most organizations are now under severe pressure this year to digitally adapt much faster than they have been. The prime reason is that technology change continues to speed up, and the distance between what enterprises need to do to be digitally competitive and what they're actually doing is growing. This has turned into a vital existential issue: The number of companies that have encountered end-of-life events in recent years has led to the many dire predictions for the curtailed longevity of the large enterprise that are cited at so many conferences and articles these days. SAP Leonardo has the potential to help with these strategic challenges across the board and become an engine for digital transformation. Yet organizations need much more depth for their digital transformation efforts than the high-level blueprints or non-enterprise-class cloud offerings that most vendors are currently promoting. At issue -- and where Leonardo offers a specific solution that is geared for true enterprise use -- is the ever-more arduous task of successfully navigating and then executing on the fast-growing number of modern new digital capabilities expected today. Staying on the technology treadmill has grown very difficult for the typical organization to achieve directly. The reasons for this abound: With IT budgets relatively flat over the last few years, the incoming technology portfolio is proving much too large and costly to absorb in terms of available talent, scope, and resources using home-grown skills, infrastructure, platforms, applications for all but the very largest players. Worse yet, is that unless organizations have already been investing in scale to develop native expertise in the complex and sophisticated capabilities of emerging enterprise tech (public cloud stacks, cognitive technologies, connected device hardware/software, open ledger stacks ala blockchain, to name just a few), then they're already years behind, never mind figuring out how best to combine these technologies together into a cohesive and mature set of digital business and customer experience offerings. They need a way to catch up and sustain the exponential tech growth curve. Instead, for many organizations, what's really needed are ready-to-use platforms that combine all these digital services together into proven capabilities that are refined and matured across many customers. This is exactly what SAP, Salesforce, and many others did back in the day with ERP and CRM, and to which enterprises were largely happy to delegate while receiving best practices and economies of scale in return. It appears to be the same route that most will now have take to deliver on the promise of today's next generation of enterprise technologies. All of this is why few CIO or CDOs will be rolling their own target platforms for digital transformation. Instead, they will be curating a small but top flight set of next-generation digital business platforms, of which Leonardo is a prime example, from market leaders that they can then realize their specific digital businesses strategies upon. I've previously included the SAP Cloud Platform on my informal short-list of digital transformation target platforms and Leonardo is an important extension of this platform that's aimed at a) enabling contemporary digital business -- which will ultimately represent the majority of revenue generation for companies within 10 years -- and b) representing SAP's product suite for the latest strategic enterprise technologies. Leonardo clearly shows how what I call digital transformation target platforms are really dividing into two halves as a category: a) Enterprise-class Platform-as-a-service (PaaS) offerings that offering foundational cloud capabilities like compute, data, and storage, as well as the standard applications related to the ERP suite, and b) new higher-order digital capabilities that yes, improve those same standard applications, but more significantly, allow them to be crafted into transformative new digital business services and business models that will sustain enterprises into the future. Examples of the higher order business functions that Leonardo can enable include helping enterprises convert unconnected market offerings into data-driven connected products (IoT), applying blockchain in specific industries (financial services, healthcare, real estate, supply chain, etc. ), and using machine learning/artificial intelligence to generate timely strategic insights to significantly improve the customer experience. Thus, Leonardo is decidedly in the latter category of target platform, which SAP Chief Digital Officer Jonathan Becher told me at SAPPHIRE NOW this week is based upon and entirely operates within the SAP Cloud Platform, which itself fits squarely in the first category. 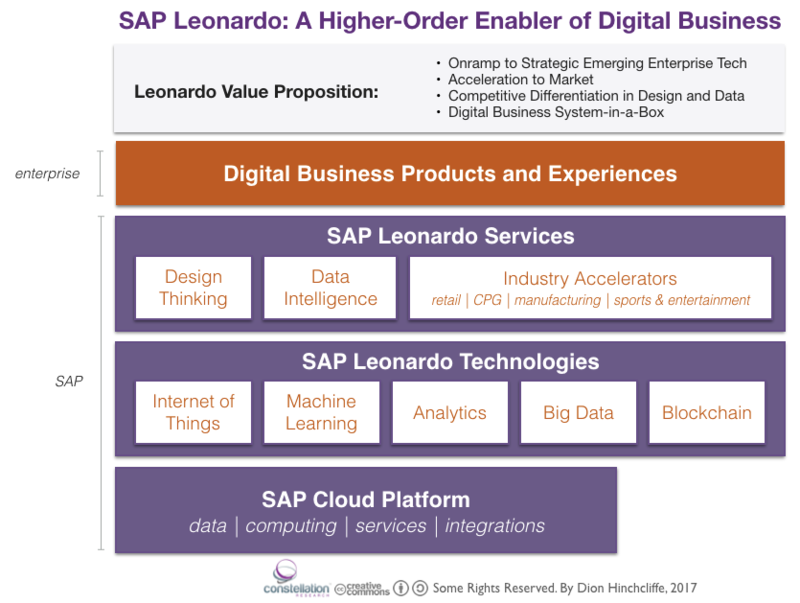 In short, Leonardo is a higher order digital business platform, while SAP Cloud Platform provides the core foundation. Leonardo can shorten the time needed to execute on a more ambitious digital business vision. How much remains to be seen, but SAP's betting that by having Leonardo's capabilities already fit together and proven by initial early adopter customers (currently Trenitalia, Nissan, and Stara) that it can help enterprise customers simultaneous take on a more expansive digital vision while also adopting the new technologies that Leonard offers much faster. Just as significantly, SAP is touting industry-specific accelerators for Leonardo. The company already plays in 25 major industries today, as they reported at SAPPHIRE NOW this week, but are currently focusing on accelerators for Leonardo in the retail, consumer products, manufacturing, sports, and entertainment industries at first. Other industry accelerators are coming. SAP claims these accelerators, which have much of the domain knowledge for an industry already baked into a reference model, can boost the execution speed of a Leonardo-based solutions by up to a substantial 50%. Leadership takeaway: If these expectations are borne out, Leonard can potentially contribute to a vital first-mover advantage in digital's increasing winner-takes-all world. Leonardo goes beyond technology, by applying its system in key ways that are more likely to create competitive advantage. Unusually among digital platforms (for lack of a better word, as SAP calls it a 'system'), Leonardo's promotional materials prominently lists design thinking and something SAP calls data intelligence as part of its central capabilities. Design thinking is an increasingly popular -- some would say trendy -- way of developing more people-centric solutions by employing empathy for the problem space. Hard data for design thinking's effectiveness is still in short supply, but most reasonable people believe the practice is more likely to produce better digital experiences than older methods. As digital customer experience is becoming the market differentiator (and a major force for value creation), SAP is anticipating that featuring design thinking in the application of Leonardo to enterprises' digital business needs will ensure its technologies are more aptly and effectively applied. Data intelligence is touted by SAP as a way to "extract insights from a large network of anonymized data." Done right, this allows Leonardo customers to use private pools of otherwise hard-to-obtain strategic data that can be employed to create a distinctly unique digital business offering. As controlling or having access to vital and hard-to-replicate sources of data has steadily become a sustainable competitive advantage over the last decade, this lets Leonardo offer a hard-to-copy value proposition than goes beyond technology. Leadership takeaway: SAP is hoping that these capabilities will offer significant advantage well beyond basic technology modernization, as Leonardo offers strategies design and data services that can potentially impart real differentiated business advantage, at least against those not already using the system. There is a risk of vendor lock-in, but the platform underlying Leonardo is multi-cloud capable. Along with the advantages of Leonardo (speed to market, vital emerging tech, competitive differentiation in design and data), there is issue of vendor and one-size fits all. The CIOs I speak with regularly these days are concerned about the tendency for the largest vendors to offer an exhaustive technology and business applications stack, making them both beholden to vendors like never before (by putting most or all of their eggs in one vendor basket) while also making it hard to differentiate in the market without very extensive and time-consuming customizations. Certainly, there are advantages as well, as a vendor being a one-stop-stop often means the product pieces fit together better, support and management is easier, etc. Leonardo's strategically significant nature certainly extends the company's value chain more deeply into the enterprise than ever and will make SAP customers more reliant on them. Yet I spoke at SAPPHIRE NOW with several customers running alternative clouds like Microsoft Azure, with SAP running on top, and reporting very good results. As long as SAP maintains this kind of friendliness towards hybrid vendor configurations that lets enterprises mix-and-match their cloud infrastructure with important new higher-order platforms and systems, then there is lower risk. Leadership takeaway: Require long-term multi-cloud flexibility from SAP (and all vendors) in your contracts, and verify Leonardo supports your planned strategic vendor mix before adopting. There was a good amount of discussion this week at SAPPHIRE NOW about the composition of Leonardo and if it hung together as workable product. Overall, I believe the vision makes sense, even if the messaging itself, which puts technologies and design/data approaches at the same level of abstraction, is a little unclear, but I believe this will be sorted out. The bottom line is the Leonardo does offer a big enough umbrella that it's clear that it's intended for enterprises that want to step into their overall digital future, whatever that may be. In practical terms, Leonardo offers a go-to-market vehicle and approach for companies that want to meaningfully adopt Internet of Things, machine learning, and blockchain technologies in an overall approach that makes sense. Longer term, the main question will be whether the elements of Leonardo truly fit together so advantageously as described, if SAP continues to incorporate important emerging technologies into it, and if some of the more interesting components, like industry accelerators, get fully fleshed out to critical mass. For now, I advise enterprises to consider Leonardo earnestly (taking care not to overcommit prematurely) for use in their digital transformation plans and experiments, especially if they are already SAP Cloud Platform customers.